Near the end of my trip, I drove up to Omaha to spent a night with Andy and Sugi. It is normally about a three-hour drive form Kansas City to Omaha. After about the first hour, I started to encounter snow which grew heavier the further north I went. By the time I hit the Iowa border, I was passing cars that had spun off the road and took that as a clear warning to slow down. Arriving in Omaha to sluggish and slushy late rush hour traffice, my trip took about an hour longer than normal. 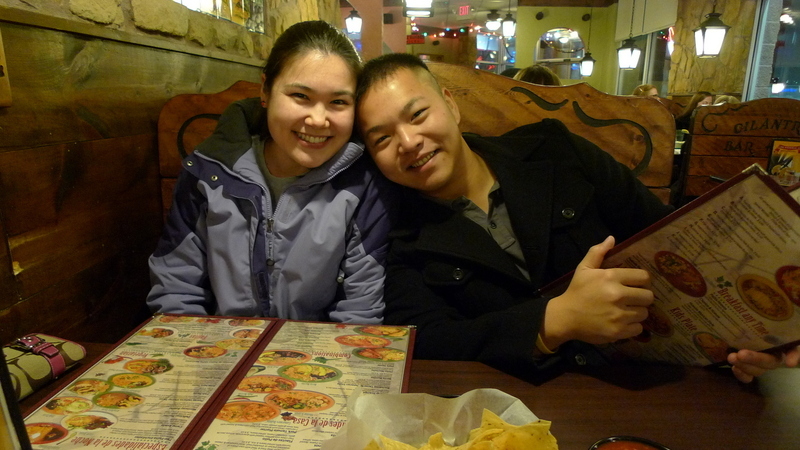 Sugi and Andy at the Mexican restaurant they took me to, Cilantro’s. Sugi managed to order the really good dish, a mixed fajitas that included some tasty chorizo. Andy had some tamales that were decent. My fish tacos totally missed the mark. Using tilapia, the tacos had a muddy flavor that I couldn’t get past. All in all, I decided not to post pictures because the dishes pretty much looked like American style Mexican food from just about any American style Mexican food restaurant. That said, the company was fantastic. Now, I’m not totally unfamiliar with snow. But at the same time, I live in Bangkok so it isn’t something I have to deal with very often. Here’s a short video capturing my impressions. View of Andy’s street the morning after my arrival. My poor little rental car really wasn’t up to the task. I wasn’t able to get it all the way up the driveway without it slipping on the ice. The culinary highlight of the trip to Omaha was a drive across the river into Councli Bluffs, IA, where Tawn and I were married a bit more than two years ago. 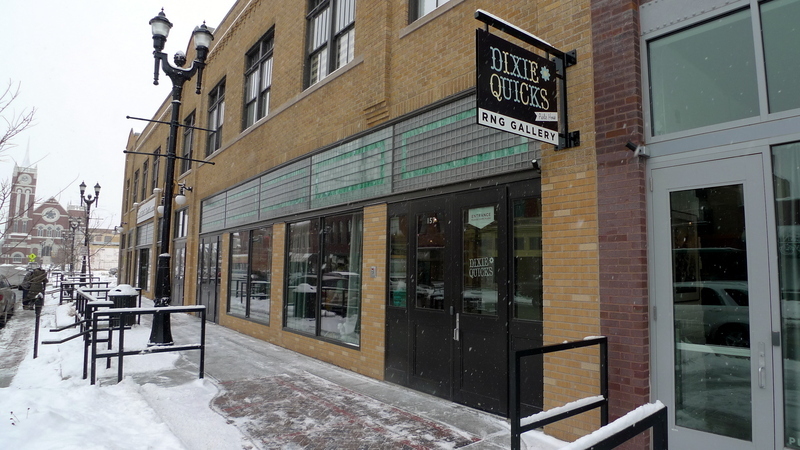 In the downtown area, just a few blocks from the courthouse, is Dixie Quicks, a combination restaurant and art gallery, which just recently relocated from Omaha. 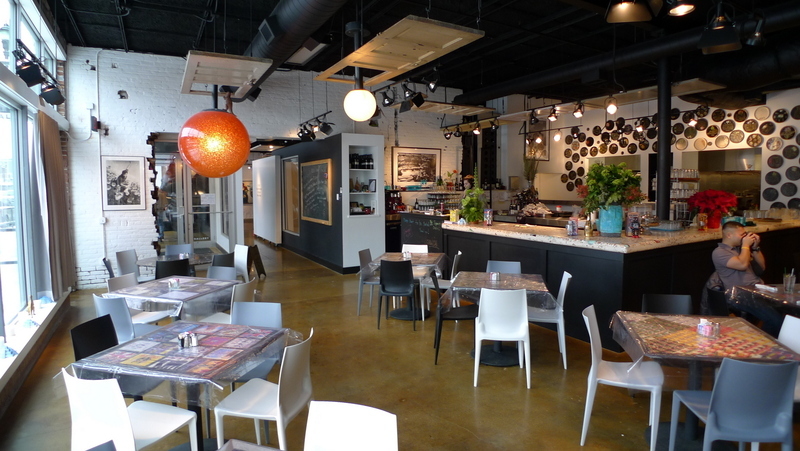 The space is fairly large, much more so than their previous space, and features an eclectic style of decorating. Chef René Orduña’s menu is a hodge-podge of southern, Mexican, and Cajun, done to good effect. 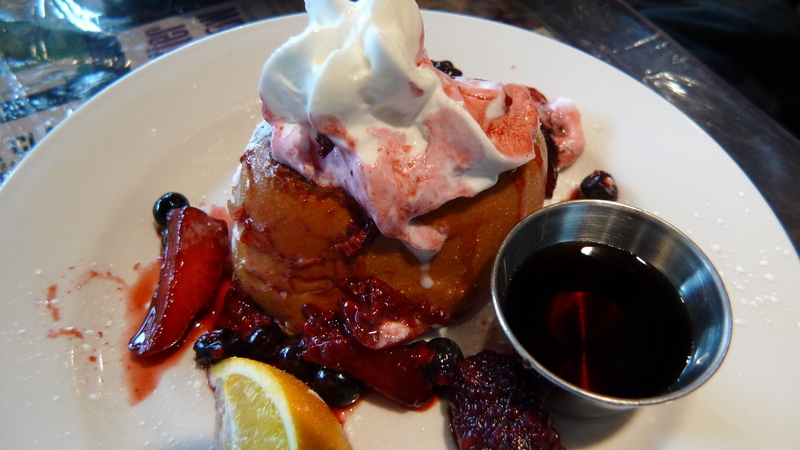 It was featured on the Food Network’s “Diners, Drive-ins, and Dives” although you shouldn’t hold that against them. The staff is friendly (ask Andy about his new nickname) and the food is good. 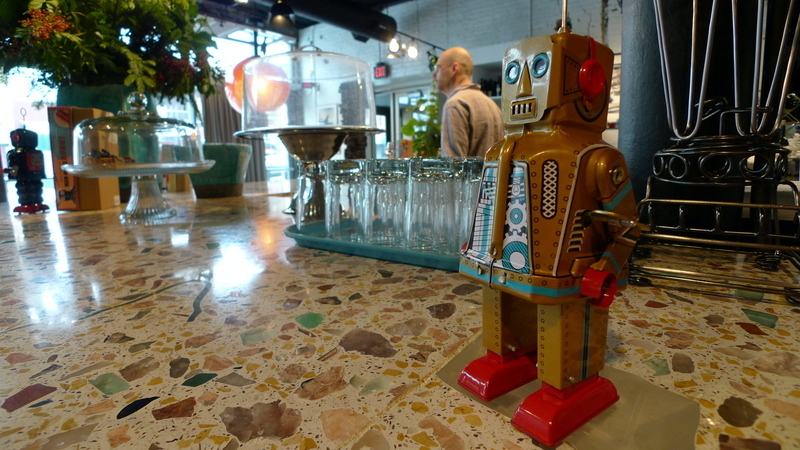 A vintage toy robot stands guard on the beautiful terrazo counter. The restaurant definitely has a retro-chic vibe. A real stand-out item on the regularly changing menu is the cornbread crab cake. Loaded with plenty of lump crab meat, the use of cornbread gives the cakes an added dimension. The sauce is a tomato butter which is made, interestingly, using the steamer on an espresso machine. If I had it to do over, I’d just have ordered three of these and called it a day. 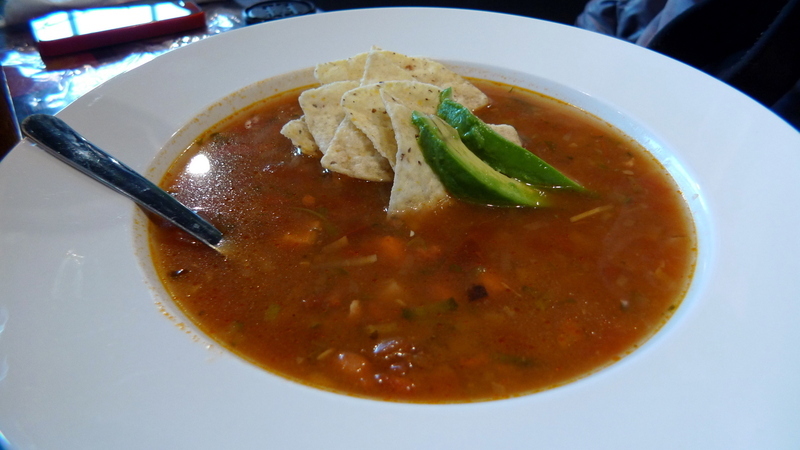 Chicken Tortilla soup with a wonderful mixture of vegetables. Good flavor and the avocado was a nice touch. Sugi ordered tortas, which were filled with avocados and lots of other tasty things. Served with a side of pickled collard greens. 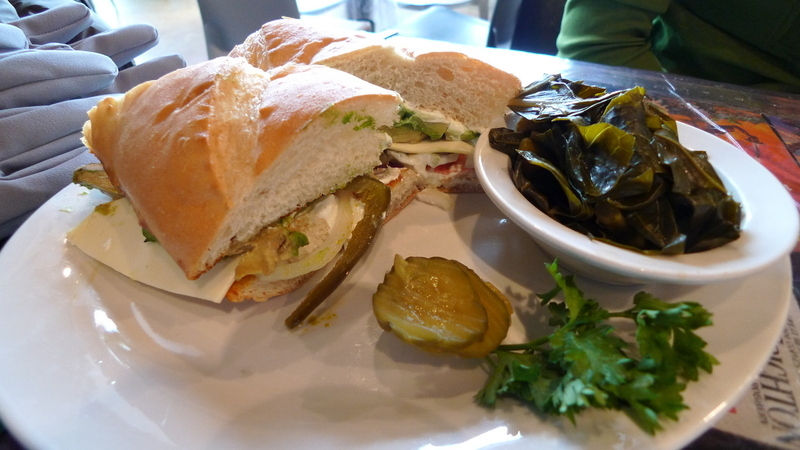 I’ve never had pickled collard greens which were, as you might expect, vinegary. Made for a pleasant contrast. While I liked the tortas, I do think that a crustier bread would have been nicer. Just my preference, though. My breakfast was chilaquilles, a first for me. A common Mexican breakfast dish, chilaquilles makes use of leftover tortillas, which are fried then simmered in salsa. In this version, tomatoes and peppers are used to create something that is reminiscent of lasagna but with Mexican flavors. 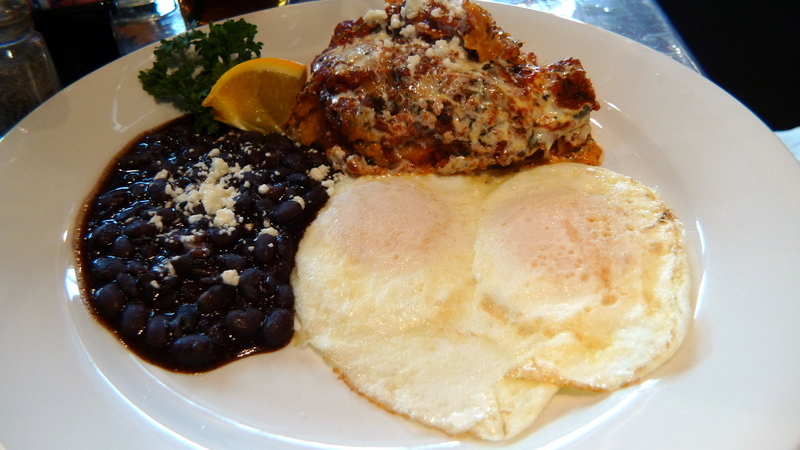 Served with black beans and two soft fried eggs, this was a really tasty treat and something I look forward to seeking out at other restaurants. We managed to get on really well with one of the owners, the one who gave Andy his nickname. 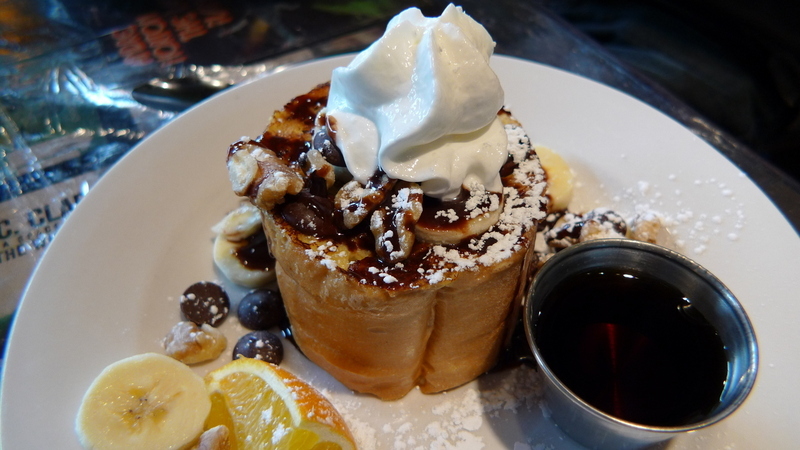 Before we had even finished our main courses, two types of French toast had been sent out for dessert, compliments of the house. The chocolate and banana is on the left and fresh berries are on the right. The bread is the same as is used for the tortas and while I still maintain that a slightly crustier bread would be better, it was hard to fault this French toast. The gallery next door was open for browsing, getting ready for a three-artist show that was debuting that evening. 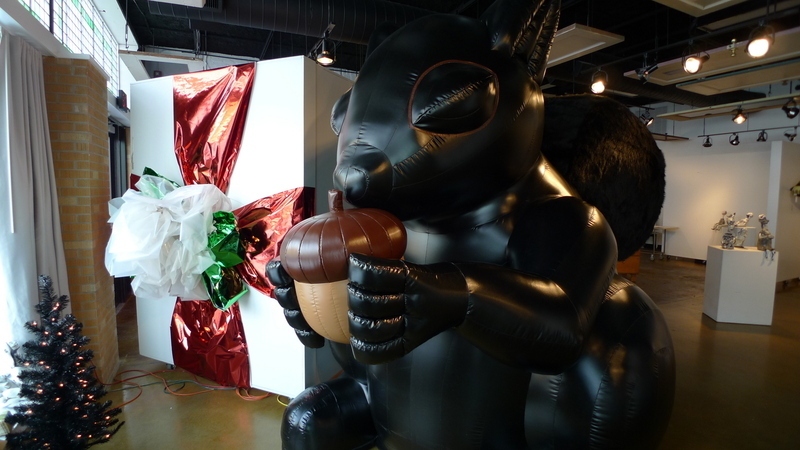 Here, a giant inflatable black squirrel holds an acorn. All in all, Dixie Quicks was a highlight meal during my trip to the US. A drive up to Omaha is worthwhile if for no other reason that to visit Andy and Sugi. But having this restaurant there provides an added incentive. This entry was posted in Uncategorized and tagged Andy, Chilaquilles, Council Bluffs, Dining, Dixie Quicks, food, Omaha, Restaurant, Tortas by christao408. Bookmark the permalink. Wow. What a trip. I am glad you drove across all that treacherous snow and did not get stuck. And what a delight that restaurant is. Who knew in the middle of IA, there are hidden gems like that. Yummy food – I would certainly travel in the snow to get some. I had a Mexican house mate for a time who made that for breakfast every morning. He was great in the kitchen. You should wear a hat. You know, helps keep the conehead warm ! I bet that little bit of snow makes you appreciate the warmth in Thiland! Hehe! Nice photos of Andy and Sugi – the smiles say it all! I thought the title to this entry was “Visit to Obama”. Then I saw Andy and Sugi… hahahaha. Oh man, I’m glad you were able to drive through the snow safely. A lot of rental cars aren’t equipped with winter / snow tires. It’s good to see the 3 of you together again. It made me smile. Thanks for sharing some snow with me! We haven’t had much snow in Toronto yet so it’s nice to see some! It looks so wintery and Christmassy! 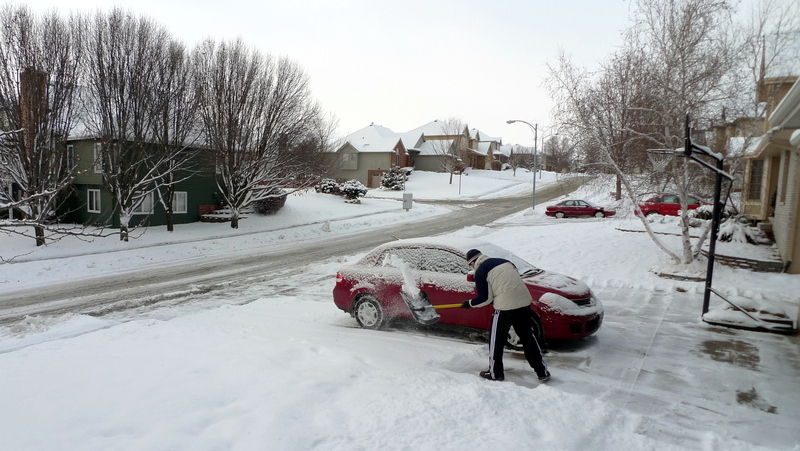 @brooklyn2028 – Glad you’ve avoided too much snow so far this winter, Sheldon. I really don’t know if I’d ever want to move somewhere that regularly gets snow. 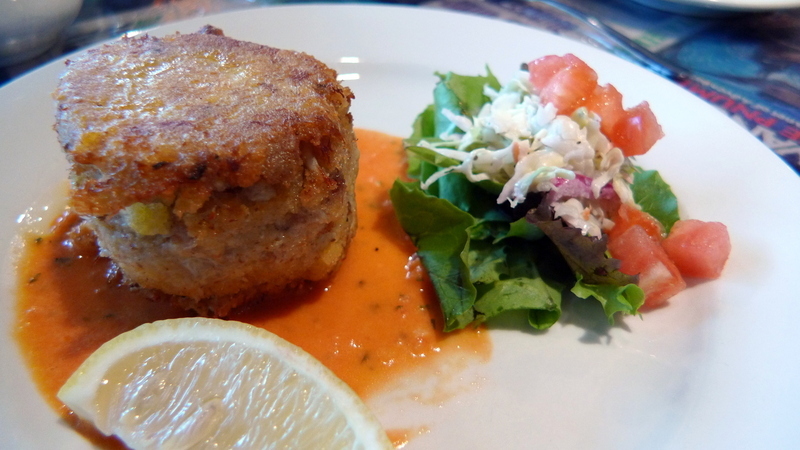 @jace1982 – Who couldn’t use a cornbread crab cake? =D@ElusiveWords – The minute I read your comment, my heart skipped a beat in fear that I had mis-spelled the title. Thanks for the heart attack, Matt. @murisopsis – “Appreciate” is an understatement. Ha ha…@The_Eyes_Of_A_Painter – Hat? What iz theez word? @Fatcat723 – Sounds like a good type of housemate to have. @CurryPuffy – Bulging biceps hidden by wintry coat, swear words being muttered under his breath – yes, it was quite a sight. @awoolham – Iowa continues to surprise me with its relative progressiveness and sophistication. @oxyGENE_08 – Andy = Food, right? @CurryPuffy – Haha glad you enjoyed it! @murisopsis – 😀 😀 😀 It’s so nice to see Chris! @ElusiveWords – We talked a lot about you 😛 ;)It was so nice to see you Chris, and thanks for driving up through the snow!!! We will have to come down next time! @yang1815 – hahaha… there’s not that much to chat about.